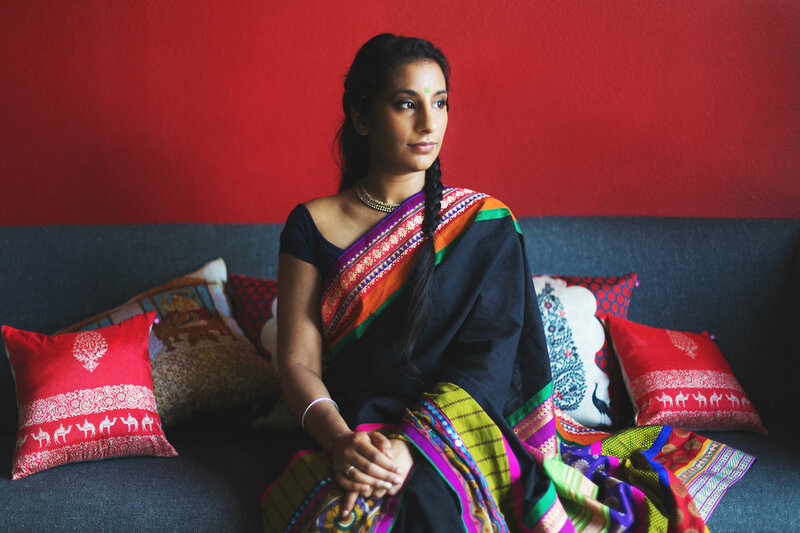 Unstitched: The Sari Project is an international, collaborative performance art project that takes a single unstitched piece of cloth – a 5.5 metre sari – and creates a line of community among 108 South Asians around the globe. There are over a hundred ways to tie a sari and unlimited ways in which to accessorize it. This project invites each participant to wear and style the garment in their own unique way and to share their individual stories. For those who may never have worn a sari before, this performance will give them an opportunity to seek out a lesson from YouTube, their mother, their aunty, their friend, a book, etc. and share this process with each other. Each participant in Unstitched receives a package that holds a sari, project instructions and writing prompts. Photography, social media and personal journalling will be used to track its journey. The sari used in #unstitchedthesariproject has been generously donated by Varnanggall. #unstitchedthesariproject is supported by The Toronto Arts Council. When I was growing up, five year old me thought that the sari was a cumbersome garment. There were so many pins involved. Lots and lots of drapes and pleats and fussing around, trying to ensure that everything fell in place. I didn’t want any part of that. Wearing a chudithar was hard enough. Seventeen years later, here I am in this admittedly stunning piece of cloth I still have a tense relationship with. The sari, in my family, is burdened by traditional definitions of womanhood and duty. It stuck to me, somehow, highlighting the curves I desperately wanted to hide. I resented how it weighed down on me during family functions and made me perspire in the humid city I call home, while my male cousins got to wear jeans and a shirt and call it a day. Constant reminders about my femininity from older Indian women did not endear me to the sari. My paternal grandmother insisted that when I became an adult — that is, when I got married, because in my family my adulthood would probably only be recognised when I crossed that particular milestone — I should wear a madisaar during important religious events. I dreaded it. Nine yards of cloth! And then I would probably have to go to the kitchen and help the other women in the family, scurrying around while the men sat elsewhere by the fire, praying with the priests. I was connected to Indian culture in other intrinsic ways, I thought. I sing Carnatic music. I practise Bharatanatyam. The most transcendental moments of my life have been during these concerts, where a perfectly executed sequence of notes or jathis would transport me to another realm where everything was brighter and more beautiful. Naturally, when I saw my senior write about this project on Facebook, I scrolled past it without a second thought. I did not expect to think about my relationship with the sari, fraught as it might be, in the days to come. But I did. Constantly. And that surprised me. 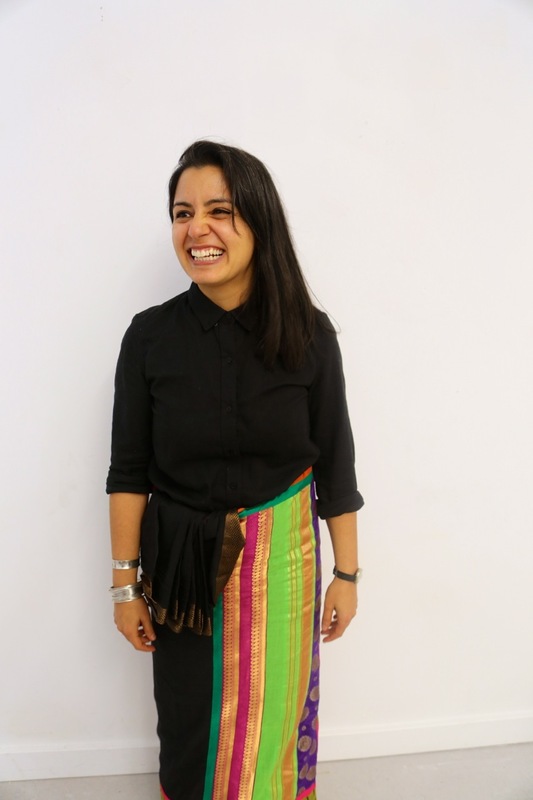 I found myself thinking: how has the sari shaped me, defined me as an Indian woman? I did not know. I still don’t have any easy answers. When my mother helped drape it for me before I took photos, I felt like a cheat and an imposter. It surprised me, then, that the photos I looked my best in were taken not at the start but towards the end of this photoshoot when I felt most comfortable. Initially I was stiff because I felt like I was on display, so I did not move at all. But my wonderful friend and photographer Nikita made me sing and dance and unpin the severe pleats of the sari my mother had tied. “Lean into it,” she said, and somehow I found myself relaxing, playing with my bangles, holding various Bharatanatyam mudras as the sun shone. It was 4pm, my make-up was melting off my face and my legs were cramping up. But I looked at the camera and smiled without reservation. I enjoyed myself. It was a groundbreaking day of personal growth and discovery, because I never thought I could feel so free in a garment I always thought was stifling. I did not think I was old enough to create my own rules. But I am. If I ever wear a sari again, it will refuse the sermons of traditionalism even though I did not experiment with that this time. It will choose to speak in a contemporary language to people across the world who see it not as something that is associated with conventionality and propriety, but rather, a garment freeing in its flexibility. It will cross borders, telling its own tales to those who will listen. I would love for it to be the least rigid of all my clothes, open for interpretation, thriving and surviving in the hearts of young Indian girls who will wear it as they choose, unashamed and proud, whether with a traditional silk blouse, or with the material repurposed into crop tops and skirts and loud printed jackets. I have a long way to go before I figure out who I am as an Indian woman, and how this garment fits into my identity in this world. And I still don’t know how to tie a sari myself. After this project, though? I want to learn. I wore the sari as a dance practice sari commonly worn by Bharathanatyam students. These are shorter than normal saris that end above the knee to allow for greater range of movement and are usually paired with cotton saris and baggy trousers. (In this case I cheated and tucked in the sari a lot more than usual to achieve the same shorter length.) I accessorised it as is for a dance performance on a small stage, keeping the jewellery, hair-do and make-up traditional, but still relatively simple by Bharathanatyam performance standards. The final accessory was a pair of ‘salangai’ – bells worn around the ankles. I chose to wear it this way as dance practice saris are what I associate most strongly with saris. After a certain age, we were expected to wear dance practice saris for classes instead of kurta tops and those were my first experiences with wearing saris. I remember the initial awkwardness with having my midriff exposed, especially as I had male dance teachers at that point – I used to find ways to pin the sari such that I could keep as much of my body covered without unnecessarily restricting movement. There was always a fear of the sari unravelling (though it should be impossible with the number of pins I used!) and it became habit to tighten the tuck-in in between each ‘korvai’ (stanza) of dance. Even the first few times I wore normal saris are also associated with dance as they were at cultural events at university, usually after performing at them – fellow dancers helped me drape the saris as we changed out from our dance costumes. In all, I’m incredibly grateful to have been a part of this project. Holding the sari that others had worn before me was a tangible connection to the wider South Asian diaspora around the world. On a more personal level, it has helped me reclaim being a Bharathanatyam dancer as part of my identity. The first time I saw this project, I immediately knew that if I were to take part, I would want to style it as a dance practice sari. However, by the time the sari reached me, I had stopped going for dance classes for close to a year due to a number of reasons, which eventually became excuses behind which I could hide my growing discomfort with my body and general lack of physical fitness. To continue to style the sari as a dance practice sari, when I wasn’t even dancing regularly, did not feel authentic anymore – being a dancer was an aspect of my identity that I felt that I did not have the right to claim at that point in time. Yet this was the idea that I kept returning to even as I explored how else I would want to style it. And so, it left me with only one option: to go for dance classes and get back in form. Until then, I had not realised how much I had given up by allowing dance to fade out of my life – not just the grounding of the physical activity of dance itself, but also the community of dancers and teachers surrounding it, the connection to language and culture and the thrill of holding an audience enthralled as one performs on stage. Bringing dance back into my life has probably been the biggest personal impact of doing this project. Bringing the concept to life was also a personal challenge. I was inspired by a fellow dancer who had done an outdoor dance photo shoot in Norway, with the aim of making art more visible by moving it from just performance spaces to public spaces. I knew that I wanted to do something similar in Singapore, but it was daunting, and almost nauseating, to think about wandering around in public in dance get-up – something that had been contained to the relative privacy of dressing rooms, classrooms and stages till then. Luckily, a friend who I had approached to do the photography was sold on the idea and pushed me to follow through on it despite the nervousness. It also helped that the dancer I had been inspired by came down during the photo shoot to provide technical and moral support. Once I got through the initial discomfort, the experience was in fact strangely liberating! I’m grateful that this project has pushed me out of my comfort zone, much as tying my first sari did years ago. I first visited India aged 13 where I attended an Indian wedding. Here I was surprised to see that Saris were worn daily by most women! I had always thought that this was just something told through film and on a screen. A Sari to me shows heritage, culture, tradition, personality and style. Growing up in the U.K. Sari's are exciting to wear as they only tend to be worn on occasion. Wearing a Sari makes me feel proud, happy and belonging to my roots and culture. It makes me feel strong! It is one of my connections to origins. I recently took a brave decision in my career to leave my full time academic job in Law as a Paralegal and pursue my passion as a Vocalist in Indian Classical Music. From childhood I have always learnt music and I am always a student to this day. Each time I perform I feel a wave of emotion, a rush of excitement and most of all I feel happy to have followed my dreams and dedicate my life on something I enjoy. I tie a Sari and sit to perform...I feel comfortable,,,I feel strong as a women in the difficult wold of the arts..and I feel brave! My choice in Saris represent my personality and me as a woman. I choose patterns, thread work, intricacy and colour. A sari to me, is a flavour of that individual woman and what she represents! Sari's have been in my life and with me at my happiest times. They have made me feel beautiful, brave, able to achieve anything and powerful! When you think about saris: What associations, memories, or experiences come to you? ; What sensations and emotions do you feel when wearing this sari? The first memory that comes to mind is the first time I bugged my mum to let me try on one of her saris. I must have been around 13/14. We were in her room, clearing her closet and out pops this bright, (almost neon) lime green sari. She must have let me try it on because it clearly wasn’t one of her favourites. And I just remember looking in the mirror and feeling like the most beautiful, happiest girl in the room. From then on I remember sometimes spending hours on tying saris in different ways, youtubing different styles and just going absolutely crazy with the creative options of this simple yet complex, elegant piece of material. Thinking about how you see yourself and how the world sees you, what is your relationship with the sari as a clothing? I feel that the sari is probably the only clothing that in a way unites every caste, religion and class, especially within South Asian cultures. Yes, there may be different ways and styles of tying the Sari (Maharastra, Gujarati, Bengali etc) which in a sense can ‘differentiate’ between different parts of india, regions and cultures however I feel that this is more of a fashion statement and in this day and age more a preference, rather than anything to do with caste, religion and class. And this is something I really connect with when it comes to tying and wearing saris. The sari for me is also something that makes me feel extremely elegant, powerful and proud of my roots. I remember whenever my mum tied the sari on herself or me she would always tell me that posture is something that really brings out the grace of the sari and the woman wearing it. Can you talk about how and why you have worn the sari in the way you have? Though I’ve grown up being quite obsessed with the different styles that can be created with the Sari, I’m also very bad at tying it the tradition and most popular way. So if I ever tie the sari myself, I’ll always do it in a very “indo-western” style. Usually if I wear the sari to an event I’ll pair it with some jeans or some colourful tights. The way I’ve tied the sari is by pleating more than half of the sari, tucking that into my jeans (in this case, shorts) and then finishing it off by draping it over my shoulder the traditional way. In terms of location, I gave all creative freedom to my husband (who is also a photographer) and he loved the idea of it being something quite playful, modern yet retro Bollywood. So we decided to go all out and be extra and shoot it in a games arcade. How do you feel about being part of this project? What does it mean for you? I feel absolutely proud and overjoyed to be a part of such a unique and influential project. 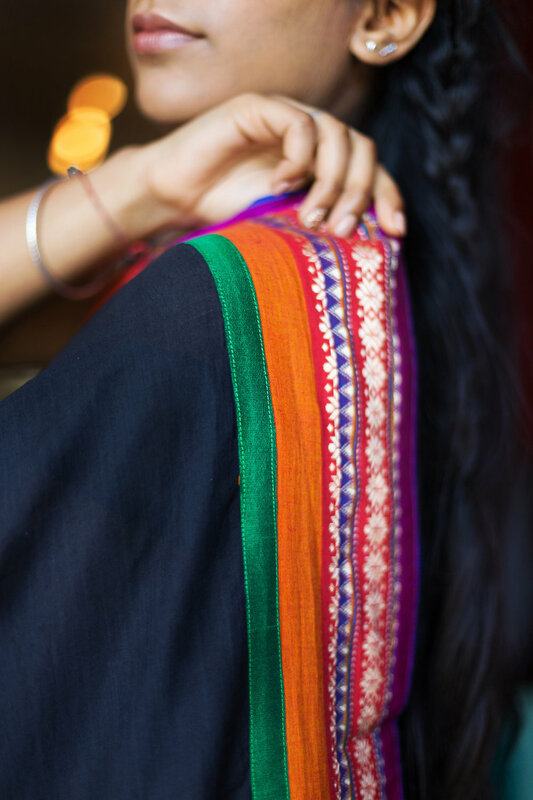 It gives women from all over the world to be able to express their thoughts and views on the Sari, whilst bringing together different ideas and cultures. Extremely thankful for my old friend Seetal Gahir for passing the sari on to me and also allowing me to be a part of her ‘Unstitched’ Sari journey by letting me do her shoot! When I first came across the #Unstitched Sari Project, I immediately thought it was a beautiful idea. Wonderfully simple but such a powerful way to show how we’re all connected through different threads in our individual stories. HOW COMFORTABLE DO YOU FEEL WEARING THIS SARI? Pretty damn majestic. It’s really unique and super comfortable because it’s cotton. I don’t usually wear dark colours but I love the colourful highlights. Not something I’d usually wear but I am feeling it! ARE SARIS SOMETHING YOU FEEL YOU ARE ENTITLED TO WEAR AND CALL YOUR OWN? WHY OR WHY NOT? Absolutely. There is an association in the Indian classical arts that the sari is a symbol of timeless tradition. For example, you would traditionally wear a sari to attend a concert or if you were performing on stage. I find it a genius garment that is comfortable and elegant, once you get the hang of it. It’s part of Indian culture and almost a passage of womanhood. But the sari is also so versatile that you can really style it to reflect your own taste and personality. THINKING ABOUT HOW YOU SEE YOURSELF AND HOW THE WORLD SEES YOU, WHAT IS YOUR RELATIONSHIP WITH THE SARI AS CLOTHING? Anytime I wear a sari I feel an instant sense of power, grace and sensuality. My posture aligns but I relax into it at the same time. My relationship with the sari is that I believe it portrays a sense of classicism and as an Indian classical dancer and advocate of Indian classical music, I feel the sari really embodies my values of simplicity, craft, detail and art. It will never go out of fashion and never look ‘old’. I remember wearing my mother’s silk saris that she was gifted by her family when she got married. I remember her teaching me to tie it and my mother in law and husband’s grandmother giving me tips on how to tweak the material for different effects. The sari contains stories. Memories and lives are woven into it. They embrace you as you wrap it around your body. It protects you and empowers you at once. DOES WEARING A SARI CHALLENGE YOU IN ANY WAY? Not particularly. Different materials can be a challenge to tie. It also depends what you’re doing. Sometimes it can start slipping around and shifting and then you just feel like the whole thing is going to come apart. The key is not to panic, find points in the fabric to quickly adjust and to just enjoy the way it hugs and highlights your body. I’m comfortable wearing a sari anywhere now - it’s taken a few years to be comfortable out and about because I prefer to remain anonymous, and wearing one outside of India sometimes elicits looks. Once I was wear my black pashmina sari in NY and someone asked me if I was wearing ‘Yohji’. I thought that was pretty funny. I gather people feel the need to try and place it. This sari is worlds apart from what I would wear, which is why I also wore it on the reverse side and made the ‘non-pallu’ end as my pallu. That’s how versatile a sari is. I love how dozens of women are wearing this particular one and making it their own. I definitely feel entitled to wear and call my own. It’s something that feels more natural to me than a dress, and definitely more than a skirt. I’m not sure why - gather my familial and cultural coding is as such. I draped the sari this way because it’s how I usually wear it: short to my ankles and pleated in the back. I find it really comfortable to wear and don’t have to think twice about it. I’m not sure how I ended up making this drape, but I know it’s adapted from a few, and now it’s my go-to drape. I wish people knew how easy it was to wear - because in all my research and work on the sari, the number one ‘complaint’ is that it is cumbersome to wear. It’s an unfortunate opinion, mostly developed through a rigid perception of the ‘correct way’ to wear a sari. It’s an uncut cloth…. truly limitless! To me, the sari serves as a symbol of culture and gender that stands with its own strength and grace. Whenever I wear a sari in public, I always feel empowered by the fact that I am wearing and representing my heritage. Because we live in a society that is constantly trying to force internalized white supremacy on black and brown communities, I think it’s important for us to take pride in our people and the struggle we are connected to. For me, wearing the sari is not just a fashion statement, but a statement that we are in touch with our identity and our ancestors, and that we will not be erased. Furthermore, after years of being told that our culture and skin color are inferior, we are starting to see South Asian clothing and accessories being sold in stores and appropriated on a mainstream level. Wearing the “Unsitiched” Sari gave me the opportunity to reclaim the bindi and the sari, which I will continue to do as an act of resistance and cultural preservation. I chose to wear the Unstitched sari while decorating some local walls here in LA. As a street artist, I had fun combining elements of street style with my sari. If you think about it, the sari is the ultimate form of street style in the motherland so it felt very natural to be rocking it in and around my hood. Also the several yards of fabric were perfect for reaching high and low spots while perfectly concealing cans of spray paint. The mesh top was in honor of all rude boys and girls across the globe and the M16 necklace represents the crew I ride with called TRUST YOUR STRUGGLE collective. When I think about saris, I think about my Naani. She emigrated to Ohio from India in 1969 as a single mother at the age of 35, with two daughters, ages 10 and 11. She had no relatives in the United States, and managed to raise her kids on a grad student stipend, followed by a career as a social worker. She wore a sari to work nearly every day of her 30 year American career, with sneakers underneath stealthily grounding her in nononsense boss mode. I think about the racism and xenophobia she must have experienced. I think about the dignity and selfpossession she must have had, to face discrimination and still choose this elegant act of resistance day after day, year after year. I spent every summer with my Naani from ages eight to seventeen. I remember her coming home from the office in her regalia, as if it was commonplace, and how confusing that was to me given in my New Jersey life, saris were something my mother and aunties only wore for parties, weddings, special occasions. I didn’t understand that saris were as comfortable for my Naani as jeans were for me. I had no idea that she’d grown up riding bicycles in a sari not until I got curious about family history as a college student, pored over family albums, and found pictures of her doing so. My first memory of wearing a sari was at age 8, when my Mousi (mother’s sister) got married. I remember feeling like a princess, feeling pride in my culture, in the beauty of the silk, in the luster of the earrings, necklace and tikka, the sparkle of the bangles. In school, some of the white kids taunted me about being Indian: about my hairy arms “you’re like a gorilla!” about the barfi topped with silver leaf my mother packed for dessert in my brown bag lunch “ew, what IS that?” or even, in what might’ve been a hilarious crisscrossing of racism if it wasn’t so painful “where’s your bow and arrow, INDIAN?” So the first time I wore a sari, it felt like some cultural fairy grandmother had transformed me. I felt beautiful a very rare feeling in my childhood. By the time I got to college, the alchemy was no longer so accessible. I was out about having divorced parents, about being from a lower middle class single parent family, and about being a survivor of child sexual abuse. I didn’t have the language at the time to accurately name my queerness or genderqueerness, but I was aware in many ways that I did not fit the norms of my parents’ community, norms most of my South Asian peers on campus were invested in replicating. I didn’t speak a South Asian language fluently. I didn’t cook Indian food. I didn’t play any Indian instruments or do any classical Indian dances. Even my attempts at bhangra (as a half-Punjabi person raised in Punjabi community) weren’t up to par not graceful enough, more interested in playing dhol or learning the “men’s” dance moves. Every time I wore a sari, I simply felt like I was in drag, an impostor. Wearing this sari felt more comfortable than most sariwearing experiences I’ve had. It was the only sariwearing experience that didn’t feel like I was doing femme drag. First, I’d never worn a primarily cotton sari before. It was so breezy! And so much easier to pleat than the heavy silks I’m accustomed to. I decided to be brave and wear this sari all on my own, which is only the third time I’ve done so. One YouTube tutorial, and several frustrated pleating attempts later, I succeeded (with special thanks to my boyfriend Pat for fastening two safety pins for me). I normally only wear saris for special occasions weddings, engagement parties, galas and the like so wearing this beautiful sari to a summer beach bonfire and to a friends’ desi garage punk band performance at a local bar felt subversive in some way. I decided to wear my Converse with the sari as a nod to my Naani’s years of sarisneaker wearing, along with mismatched jewelry: green/red/gold earrings and necklace, blue bangles, and silver anklets. I chose to wear the sari Gujarati style, with the pallu in front, over my right shoulder. This made it easier to move about, while showing off the beautiful work on the pallu and giving a nod to the many Gujarati friends I grew up with in New Jersey and continue to be in community with (many of whom have helped me wear saris over the years). I chose a green blouse that actually goes with my Nauvari, a nineyard traditional Maharashtrian sari, to represent my Naani’s culture, and added a black bindi as a finishing touch. The bonfire was mostly attended by African American friends and community members, while the band performance was mostly attended by South Asian friends and community members. The reactions in both spaces were really different. Many folks at the bonfire seemed enthralled by the sari, and I received many benignly ignorant questions such as “is that permanent?” (about my bindi) along with appreciated compliments about my “beautiful costume” and several inquiries about what it was called and where it was from. It was clear that many people in that space had never seen a sari before and were not familiar with South Asian culture or dress. In contrast, at the band performance, a primarily desi gathering at a local bar, folks seemed confused as to why I was “so dressed up,” though many also complimented the work on the pallu and the pairing of Converse with sari. Overall, participating in this project feels really special to me, knowing it was initiated by a fellow queer desi woman, knowing that it will be worn by over 100 South Asians worldwide, many of whom do not fit the norms of our homeland or diaspora. I thought a lot about the symbolic threads connecting us through the literal threads binding us through this project while I was unfolding, ironing, pleating, removing and refolding the cloth. Thanks, Meera, for inviting me to be part of such a unique experience. I love everything about saris. From the moment the design is conceived as a one dimensional surface with plays on texture, color, motif and weave to a three dimensional garment once draped on the body. I enjoy playing around with drape styles depending on the time of the day or night and where it is I am going. Does it have to be more functional that day or can it be a bit more delicate and fussy for the evening? I usually wear saris a few times a month here in Delhi either at my studio during the day and out in the evenings. Twisting, knotting, pulling, draping, tucking, scrunching are part of my routine as I sculpt the sari around my body. I normally wear saris without petticoats and safety pins (I am sure some Aunty out there is cringing at such impropriety!). In my closet one can find a myriad of handloom saris both in cottons and silks. From delicate jamdanis, to intricate ikats, to tangails, to agrakh block printed and many more. It just feels right wearing a sari here in india especially in your style…I wish more women would wear them and feel inspired enough to experiment with drape style. I have worn the #unstitched sari in more of dhoti style and have brought the pallu around my neck to the front and love the way the pallu fans out. Instead of wearing a petticoat, I just knot the sari to itself and go from there! My oldest and fondest memory of a sari-clad, power wielding person is that of my aunt. We lost her a couple of days ago to an illness that she fought against really hard making her a true inspiration in times good and bad. My perception of the sari defining grace and strength are derived by the ease with which she wore the sari. Adventures based on visits to a Grandaunts wardrobe full of handwoven saris that dated back to the 30’s and preserved immaculately for us to use only made this garment even more precious. The sari hasn’t yet found its way into my day-to-day wardrobe but I do perceive it more that just clothing to wear to play ‘dress-up’. Its simplicity from being completely unstitched to its versatility of taking the shape and drape of the wearer to it being a canvas for a skilled weaver and its extreme functionality due to its multiple uses never cease to put me in awe. I have worn the sari with a comfort fit crop that is solid in colour and compliments the colours used in the sari. The Back of the blouse has bow tie details that add in an element of surprise and intrigue – a detail I love to play with. I love to whip out a bindi at any given opportunity and I normally always use one when I’m wearing a sari. I am not nostalgic for the sari. If I think back to my childhood, the only person I remember wearing a sari was my paternal grandmother (technically and ironically enough the least Indian person in my family). My aji was half Maharashtrian, half English-Irish and born Regina Gadgil(e). She believed in the morning shower after which she emerged from the bathroom smelling fresh as a (Yardley) daisy in a sari blouse and petticoat, with a thin chequered towel for a turban to help dry her shiny silver hair. Though she always draped her sari in front of the mirror next to me, I don’t remember paying attention (let alone being mesmerised or wanting to learn how it was done). I was happiest in matching T-shirts and shorts sets, reading Enid Blyton, collecting Barbies and cuddling her dogs. She was my weekend grandmother. My other grandparents had me the rest of the week. My nani is Goan and she wore and still wears skirts and tights and sweaters. Sometimes we share clothes. There is evidence of her in a sari at the primary schools she taught at, in a faded class photo or two maybe. I don’t remember her wearing one ever. I think my mother wore a sari to her second wedding. I am not certain. She did not invite me. And so I really discovered the sari for myself. I moved back to India six years ago from New Zealand/Australia as an adult, and made friends (as you do) and one of those friends decided to get married. I had nothing to wear but my aunt saved me. For the occasion, she gifted me a sari from her own closet, a bright fuchsia one with sequins, that she ‘would never wear’. She told me all I needed was to make a blouse and buy a matching petticoat. I didn’t know where I’d have to go, or what that would really entail. I remember feeling rather helpless. I cursed my lack of knowledge, my grandmother’s anglicised wardrobe, my not-quite-Indian-enough upbringing. Though I found it incredibly elegant, I remember opening up that first sari and thinking ‘What on earth, this is just cloth, what am I supposed to do with this?’ Five years later, I learned what a border and fall were. A month ago, I learned how to fold a sari. In the years between, my non-relationship with saris sparked new (brief and intimate) relationships for me. I’ve been draped by my elderly neighbour whose wifi is always broken that I sometimes try to fix. I’ve rushed to the family suite at destination weddings with desperate pleas. I’ve been dragged off the dancefloor as my pleats were spotted behind me by a kindly aunty who redraped me in the washroom. I’ve been pinned in a dozen places by other people’s glamorous mothers and begged friends’ wives to help me. I’ve been dressed by strangers who have never worn a saree themselves but had seen it being done in their own families. At first, the sari didn’t feel like my second skin, I loved it dearly but ultimately, I felt bulky and frumpy. I tried to make it my own. I paired them with T-shirts and with sneakers (to equal disgust and delight). I attended Christmas parties, danced at nightclubs and wore them to high tea. Earlier this month, a friend of the bride at a wedding held my sari in her hands and instructed me sharply, “take off your petticoat.” I gasped when she was done, I felt like me. I decided it was time to learn how to drape myself. Though I now have probably ten saris of my own, today is the first time I didn’t ask anybody to help me. I wear my own sari now. I’m wearing the sari petticoatless with my great-grandmother’s antique lace wedding sari blouse. I never met her but I love that I inherited something sari-related. Today is also the first time I took a self portrait using a tripod gifted to me by a boy I once dated. I am not nostalgic for him either. I feel incredibly happy to have played a small role in Unstitched and the beautiful journey that this Sari will have gone through when it passes the hands of 108 individuals. I love that just a few yards of cloth has the power to make me feel so many emotions simultaneously; nostalgia and pride about having grown up with so many strong, beautiful Indian women in my life, as well as familiarity and confidence that brims from being a part of this rich and vivid shared history of millions of women of South Asian descent. I spent the first few days that I had with the Sari admiring the various kinds of fabric that were stitched on to this relatively simple five and a half meters of cloth, and dreaming about its travels, those that have gone by, and those yet to come. And then I began wondering where and when to wear it… surrounded by creative individuals, my days often entail a healthy balance working by myself at home and spending time with fellow artists, ensuring, I believe, that I am constantly learning and constantly growing. It felt fitting, therefore, that I chose to drape the Unstitched Sari to create a small art project with lens-based artist Shraddha Borawake. Wearing it, I entered a Chickoo orchard and had lunch with the farmers, who Shraddha knew well. Rather than feeling uncomfortable wearing an outfit that I normally reserve for weddings, I felt much more at ease. In fact, a strong sense of joy and pride took over me as I shared the story of this Sari with the men over earthy bhakri and mouth-watering lentils. Talking about Unstitched and the presence of a clicking camera led to a spirited exchange of our views on art, on local Maharashtrian culture and tradition, and drifted into anecdotes about our ancestral villages. The afternoon had now transformed into an occasion, a simple, poignant one of eating with friendly strangers under the shade of a Chickoo tree on a hot summer’s day. Isn’t that the life? The Saree came to me a week ago. The Unstitched six yards of grace and style. I was overcome all at once by a feeling of pride and humility as I realised what this actually meant. I was holding in my hands the vestment that I was going to share with a hundred more women from all over the world, custodians of a sartorial tradition like no other . I was to wear this Saree and share my experience with the world as had done a woman somewhere in this world before me and as would another woman after me and one more after her and so on till this drape had adorned all the hundred and nine women waiting with bated breath to be a part of this project. As I wonder at the intricate way in which these totally different weaves and colours and patterns, so different from each other have been brought together to create such a perfect bit of artistic wizardry I see in it the same power of diversity that has made my city what it is. The same amalgamation of so many different layers of socio cultural influences that comes from being together cheek by jowl for centuries. All of it woven together into an intricate tapestry of so much beauty it defies description. Bombay is truly that piece of tapestry and so much more. To use an oft repeated, cliched term, it’s that melting pot that brings together ingredients that are as different as chalk and cheese but come together to produce the most heady nectar. So I decided to wear this Saree and simply get out into the streets of Bombay and bring to Unstitched glimpses of my favourite spots in this beautiful city. Places I pass by every day on my way to work, my library, joints I have tea in or meet colleagues and friends for a bite, vantage points from where the tantalising glimpse of the Arabian Sea never fails to thrill me and then some more enchanting, well kept secrets in a city that never , even after four decades and more , can still stop surprising you. Like Bacchan on the wall or Kaka looking down his glasses with his twinkling eyes at me. I can never thank my friend , fellow aficionado of Bombay and well known photo journalist, Chirodeep Choudhuri for traipsing all over our beloved city with me and capturing these precious moments. I met Chirodeep through his first ever photo exhibition at the David Sassoon Library; an interesting collection of pictures he had taken of clocks he found in the city. It seemed so natural to have him photograph me in front of that very hallway of the heritage building . Over the two decades I have known this wonderful man , there are no parts of the city that he hasn’t captured through his discerning lenses. Though of course the city will continue to spring surprises on us. I loved , simply loved wearing this special saree today. Not wanting to take away or compete with the intricate and bold colours of the border and Pallu, I opted for a plain blouse but could not resist my favourite earrings. It had to be special right ? In fact I always feel very special when I wear a Saree. And I have been wearing sarees for nearly five decades and on most days of those five decades. The specialness does not wear off. As I grew older maybe I grew a bit lazier and opted for trousers and wore shalwar kurta more often but there truly is nothing like the feeling of a crisp cotton or smooth silk wrapped around your hips and thrown over the shoulder. 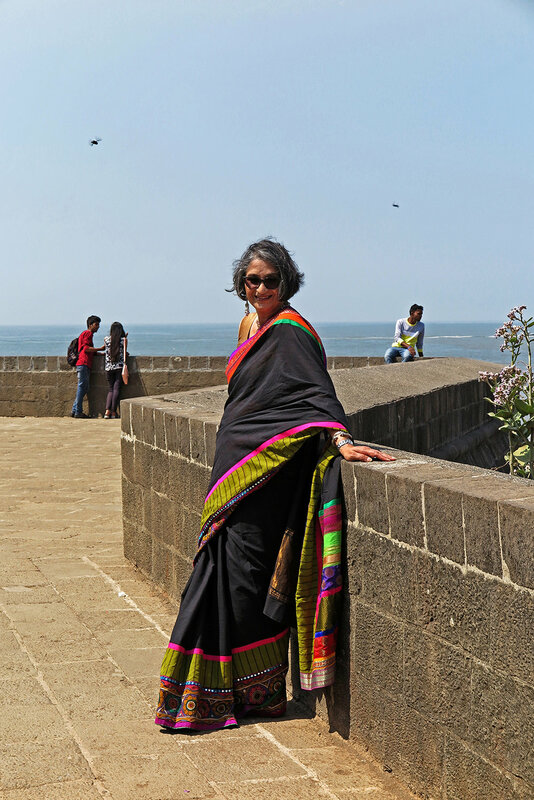 Posing on Marine Drive , at Gateway of India or on the steps of the Asiatic Library and at the entrance of the Sassoon Library or on the streets of Bandra, no one, not one passer by seemed intrigued or curious. People just walked by and past us with a smile or a nod or like some, politely waited till Chiro clicked his shot. That’s Bombay for you. You do your thing and I’ll continue to do mine. My moment of the day was when a group of women in their own bright sarees passed us by on Marine Drive saying, Hello enjoy, sahi lag rahi ho!!! My original plan was to have my Biji (paternal grandmother), who lives in Kolkata, be part of this project with me. We would each both wear this sari and share our stories associated to it as a special bonding experience, especially as she was getting older and it was becoming clear that her time with us was drawing to a close. Now as I sit here in her room, on the very bed that she peacefully left this world from this past November, I still feel ever so connected to her even though is not her in person. She lived here in Kolkata through incredible changes happening in India, having experienced the British Raj as a little Punjabi girl. I loved the stories she would share with me, telling me how she met my grandfather as a schoolgirl and he would follow her around all the time. For those who knew my grandfather, this is particularly adorable! I cannot help but wonder what my Biji’s story would have been? Today I have chosen to wear this sari in honour of her and furthermore, in honour of my Indian roots. For me, this beautiful fabric represents an amalgamation of cultures that us “Third Culture Kids” represent. I spent a considerable amount of time in India growing up, even having gone to school here. Yet at that young of an age, I could could sense that I didn’t ‘belong’ here. Or rather, it was made very clear to me that I did not belong here (kids, and adults for that matter, can be cruel!) Yet, when I would go back to Canada and growing up in a predominately Caucasian community, I was seen as the “Indian girl”. As a result, I felt as though I was always trying justify my existence. As I continue to get older, I am learning to embrace the fact that I don’t have to “chose” between the cultures that I grew up in. That it’s okay to embody both and to find your sweet spot. The truth is, for me, there really is no other way of existing. Both cultures are an extension of who I am. Being a performing artist, I constantly explore this notion as well through my crafts. I have been criticized for not being “Indian enough” in some of my performing work, or vice versa. There comes a point as an artist, however, that you realize that it not your job as an artist to create work that solely makes people happy (that could perhaps more accurately be described as entertainment – and if it also does that, then great!) But as artists we are here to express. We are here to create art because we have no other choice but to. These themes are what this sari represents to me. Having the opportunity to wear this sari here in India has been a special experience for me in that I don’t wear sari’s very often. The act of wearing it out in public occurred to me, but I chose to wear it in our family home here in Kolkata in the spots where I would have photographed my Biji wearing them. In fact, the photo of me sitting in the window-sill is the very spot in which my Biji pierced my ear’s when I was around 3-4 years old. Back in those days, they just used needles! It is one my favourite, if not most traumatic memories, being in India! And perhaps most fitting inducted me on my journey with Indian fashion and fashion in general! By wearing this sari, I feel so connected to my Biji. My feeling is she would have tried to shy away from wearing it, saying it was “too young” or “too western” for her. It is this very thing that connects us. For I feel like we are meeting somewhere in the middle. I love you and miss you Biji. I was an awkward teenager, growing up in Australia. (My father was an Indian diplomat, and had been posted to Canberra.) To say that I was a misfit is an understatement. I actually preferred wearing a uniform to school because I didn’t own any cool clothes, and either way I didn’t have the swagger to carry off the ensembles that the cool kids wore. I wore hideous glasses, my hair was oiled and tied into a plait pretty much every day. I dreamed of magically transforming into a beauty. And I thought my mother’s saris would help me do that. I could be found often in front of my mother’s closet, sliding my hands through the silk, satin and chiffon saris hanging in her closet. Even the plain baby pink and baby blue satin saris seemed lovely to me. If my mother ever came to my school, I asked that she dressed up in her sari, so that my friends could see how elegant my mother was. And I seriously considered wearing a sari to one of my school dances. Like I said, I was an awkward child turning into a teenager. I wore a veneer of confidence, to mask my insecurities as a young person coming to grips with herself. And those saris seemed to be the key. We soon moved back to India, when my father was posted back. Then I wanted to wear saris because it was the grown up thing to do, and I was in a hurry to grow up. Otherwise life seemed to be full of forbidden endeavours. Young girls like me got to wear our mother’s saris on festive occasions — maybe Diwali, or a wedding. Maybe it was a cost-saving thing for our mothers — one less outfit to worry about. But for me, it was like getting a pass into the glamorous life of adults. So what if my mother’s blouse didn’t quite fit me. I could wear small heels with the sari, maybe even a smear of lipstick, a bindi, bangles, payals — the whole nine yards. I really learnt how to wear saris during an internship as a hotel management trainee. I was 17, and interested in pursuing hotel management as a career. It was a thing at the time. My father wisely thought I should work in a hotel before deciding. While doing the housekeeping rotation, I was assigned a sari. I learnt how to run, turn down a room and appear relatively graceful while wearing a sari. But it wasn’t until my late years in university that I finally got to buy my own saris. Or rather, my mom bought them for me, when buying one for herself. My preference was for cotton — perfect for New Delhi’s dry heat. It’s also what my mother wore. 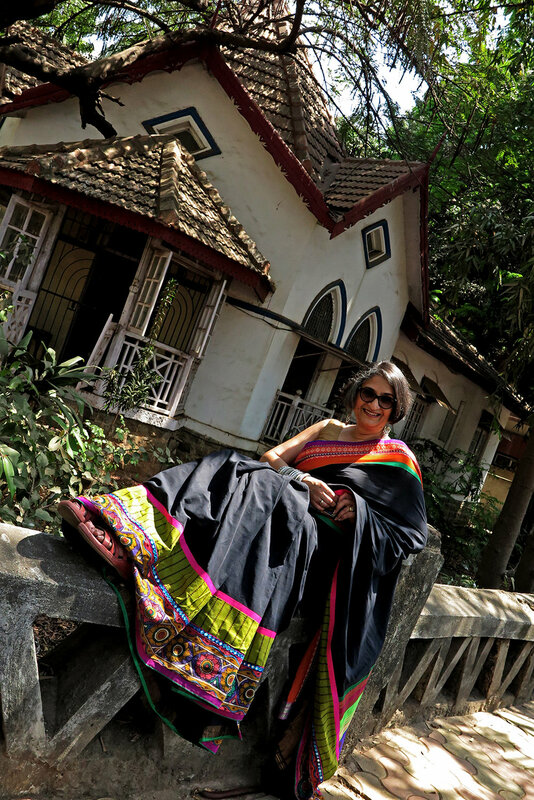 She was a supporter of handloom work, and accompanying her on shopping trips, I too started to appreciate that aesthetic, which I also saw mirrored in arthouse films that I loved, starring Smita Patil and Shabana Azmi. So I was excited to receive the Unstitched sari. It looked beautiful. I’d seen pictures of it, and researched Varnanggall, the company that produced the sari. I loved the use of kalamkari, and the vibrant colours. I ended up wearing the sari on two occasions — a Christmas party, and to watch Bollywood movie Bajirao Mastani at the theatre at Yonge Dundas Square in the heart of downtown Toronto. For the Christmas party, I paired the sari with a blouse I had recently purchased but had not had the occasion to wear. The blouse is made by my cousin-mausi in New Delhi, who has her own design boutique called Antarmann. It’s a tribal inspired blouse, with lots of embroidery and mirror work on it. I wore the sari in ulta palla style, which is most commonly associated with saris, and my preferred style. For the Bollywood film, I paired the sari with a blouse made of the traditional Marathi material called Khunn. Seemed appropriate to wear that blouse to see a film of a Marathi warrior. I also wore the sari in the seedha palla style, where the end of the sari is brought to the front, and fanned out. It is a great way to showcase a palla with work on it, and it’s easier to manoeuvre around in this variation of a sari drape. Although the Varnanggall is very pretty, it is a super annoying sari to wear — as are many saris that have a lot of work on them. This is a sari that it meant to be worn when you have minimal work to do, and where the main objective is to sit and look pretty. You can, of course, work in it, if you choose. But wearing it was a chore for me because I like my saris to be precisely pleated and draped, and this is not a sari to do that. In fact, I have avoided buying any such saris for years now, so it was kind of a treat to wear the Varnanggall sari, as I don’t think a similar sari will make it to my closet now! Even today, my preference is for cotton saris. I prefer to buy handloom if I can, so that I can support craftspeople such as weavers and the long tradition they come from. I do buy silk saris on occasion, but they can be prohibitively priced. And I can be often found window shopping online on the Facebook pages of sari design houses such as Raw Mango and Vriksh. I wear saris as often as I can — weather and other factors permitting. For me, a sari is another choice of my wardrobe, and these days I find myself gravitating even more towards my saris as opposed to my kurta pyjamas. However, the upkeep is difficult. Cotton saris require starching, which is a chore when you don’t have much space to drip-dry clothes. Ironing them is also a pain in the back, quite literally. And drycleaning silks can become an expensive affair, so I try and wear a sari a few times before I give it to my Korean-Canadian drycleaner, who has now become accustomed to me bringing a bunch of them at a time. I have grown up seeing women wear saris. I have grown up wearing saris. There’s no overt political or artistic statement for me in wearing a sari. But it is a party of my identity, yes. I do wear them as often as I can, wherever I can. I have become associated with wearing saris, and when I attend social dos wearing, people tend to comment on what I wear. Otherwise I don’t get many other reactions to it these days, not even a second glance on the TTC. The people who do stop me — as happened with wearing the Varnanggall at Eaton Centre for a bit of Christmas shopping post Bajirao Mastani screening — are older South Asian women, who remark on the beauty of the sari, and wish they too would wear their saris more often. It can also strike up an occasional conversation with a non South Asian, usually someone who wants to tell me about their trip to India, or their experience with South Asian food, etc. But those interactions are not very common. 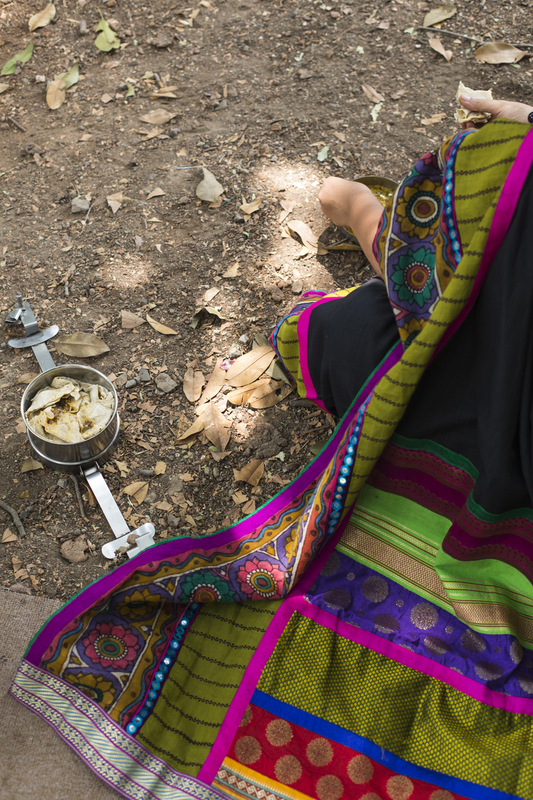 I wanted to be a part of this project because (a) I am fan of Meera Sethi’s work, and the way it questions notions of identity and (b) because I intuitively understood the subtext of this project. 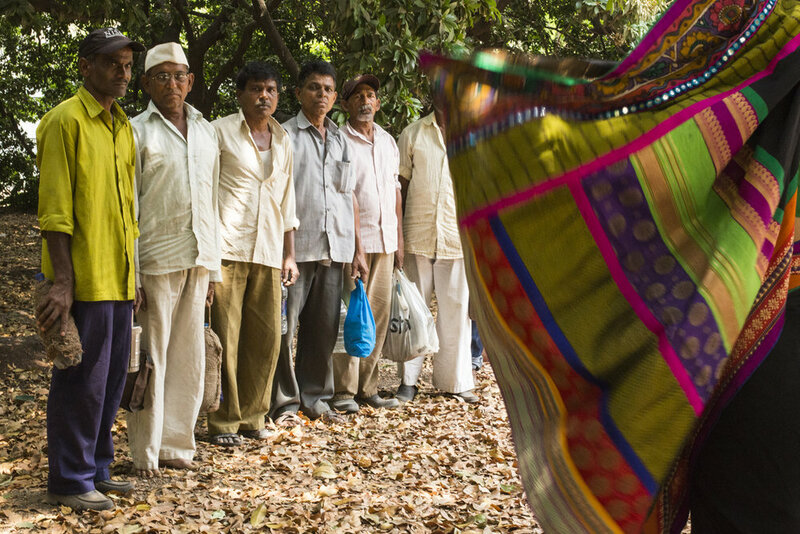 For many of us, saris are not simply an article of clothing. Your mother’s wedding sari will bring up stories of that day. Your grandmother’s temple sari will bring up a memory of a visit to a famous South Indian temple. And your own sari will remind you of the trips to find a matching piece of blouse fabric. These saris hold many stories within their folds. I had a turn with the sari after my sister wore it, so it was kind of special to feel already like being part of a chain with her. I decided at kind of the last minute to wear it to work. 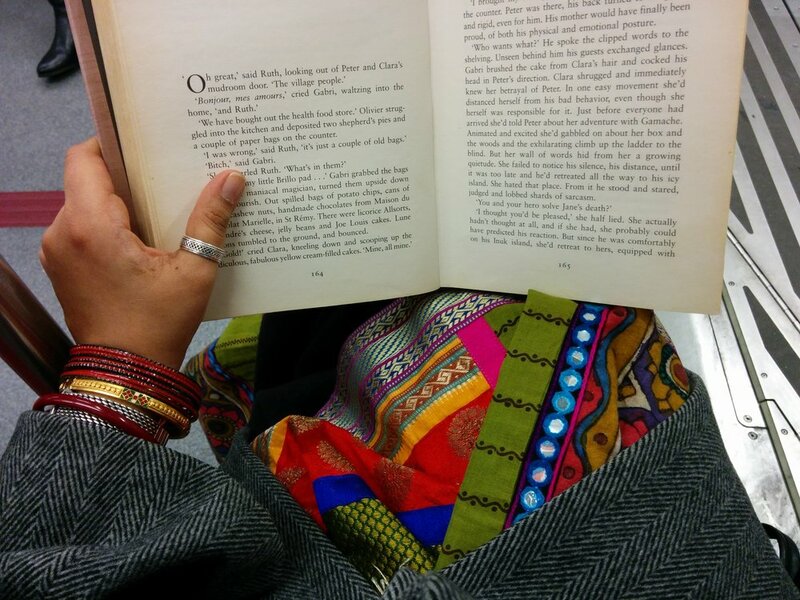 I teach at York University, and have an early morning class on South Asian Religion and Popular Culture – the perfect place to talk about saris! I wear saris rarely, and almost never before 8am – unless it’s a wedding or religious situation. So getting dressed was a bit of a scramble. I didn’t want to pin the sari at the pleats, so I used a binder clip – that was my nerd bling. It kind of worked, but not perfectly – I felt kind of disheveled. When I got dressed in the morning, I also realized that I felt incomplete putting on a sari without a bottu. As someone teaching a religion class and wondering about marking my body as a ‘Hindu’ woman’s body while also talking about a commitment to secularism, I found this to be a strange moment. Wearing the sari also meant wearing a bottu to class, which is also something I’ve never done, and something I’m still not sure I feel comfortable with. But it felt like they had to go together for me. My students, many of whom are South Asian, were curious about the sari, but I waited until the last few minutes of class to talk about why I had it on. I then talked about #Unstitched as a project. One of my students, Rakhi, is also going to be participating in the project so it was kind of cool to talk about it as an ongoing project. I spent a few minutes talking about my own feelings about wearing a sari to work, in a public space, in Canada. That’s something I’ve never done before. As a first gen immigrant who has grown up mostly in Canada, I feel in some ways not legitimate as a sari wearing body. As a teacher, I’m also acutely aware of how the way I’m dressed marks me out in university spaces – as having (or not having) authority, age, competence, and ethnicity. Wearing a sari to the lecture hall is something the professors who taught me do all the time. But is it something that I can do? And in what ways is this an act of privilege? I have a job where I can wear what I want – no uniforms or restrictions. I asked my students to reflect on ways that the sari in Canadian public space can say very different things about power, gender, labour, and identity — depending on where you are. And it can provoke a range of reactions. Something that might seem ‘cool’ in the space of a university classroom could also feel unsafe on a suburban street at night. I was excited to wear the sari, because it’s beautiful and black! (I never get to wear black – it’s always an auspicious occasion). I felt good wearing it, but I also felt a little too self conscious. It brought up for me some guilt, remembering asking my mother not to wear saris to school functions when I was a kid – I wished I could go back in time and undo that. I am shy to say, but this was the first experience of draping a sari on my own. This particular sari to me- felt like a perfect opportunity to take the time to learn, play and be present in the experience of draping a sari. I come from a family of sari-wearers, so although I have been gifted saris, and worn them often- they have mostly been draped by my big Sis, Amma, and some badass Aunties (I am certain its a whole other skill to drape a sari on someone else’s body)! Naturally, saris reminds me of home, of nurturing, and of mothering. Becoming a mother this year, makes it even more special that I lingered in the act of draping a sari on myself for the first time. A self-nurturing and self-honouring act. What surprised me most, was that there was so much body-memory, so much remembrance… that even though I assumed I did not completely know the full motion of draping a sari. I did. I knew how. I already knew! I have had the privilege of witnessing. For me, the wearing of a sari invokes all SENSES: touch (sigh…those pleats)!, sight, sound, and definitely smell. Feeling grateful to be a part of this project to experience re-awakened senses, and new Amma vibes of inner- knowing.